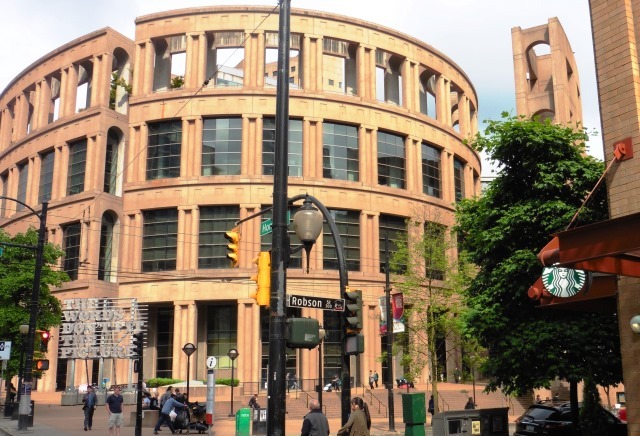 Quite possibly the most beautiful Art Deco building in the world is in Vancouver. 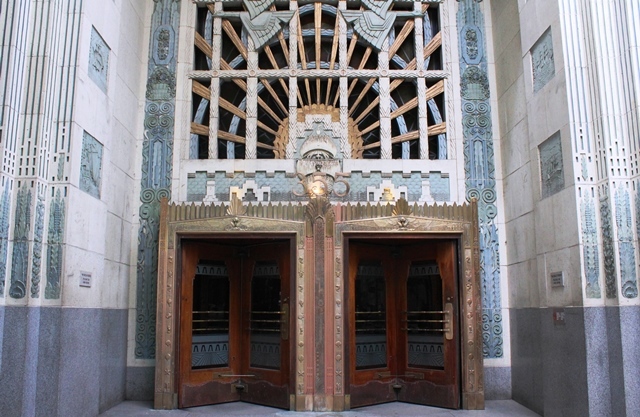 The Marine Building was opened in 1930 and bought by the Guinness family. The walls are engraved with murals depicting sea travel through the ages and quirky ocean creatures. Above the revolving doors enormous Great Blue Herons (or Canada Geese?) 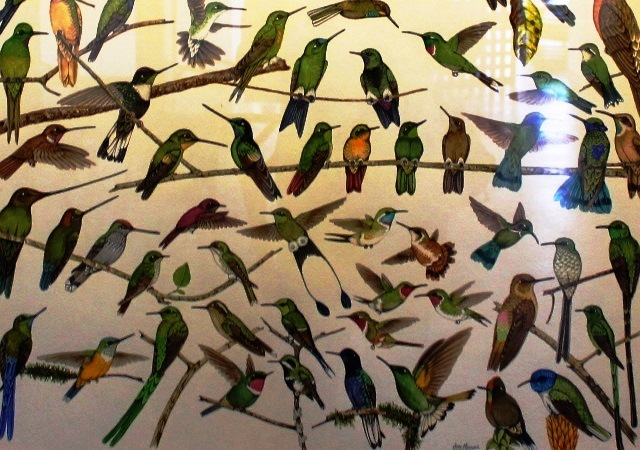 fly off in opposite directions. At one time the tallest building not just in Canada, but the British Empire, it’s now, literally overshadowed by the many newer skycrapers that adorn the city. 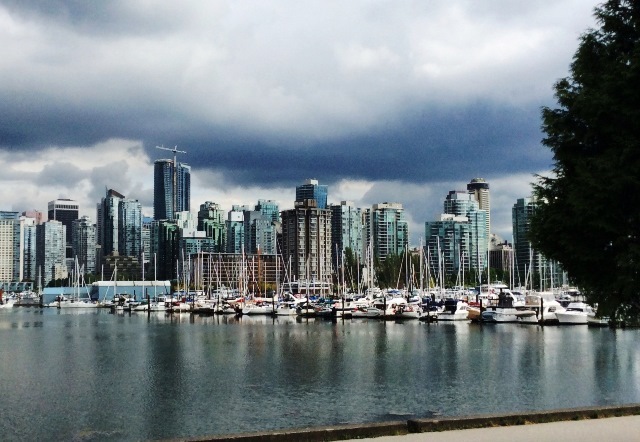 I recently spent 24 hours in Vancouver, the urban heart of British Columbia; it could easily have been a week. Here are 10 things to do in Vancouver, especially if you enjoy getting a real feel for the place you stay in. Rhododendrons flower in spring and in summer the sensuous scent of thousands of roses wafts through the air. 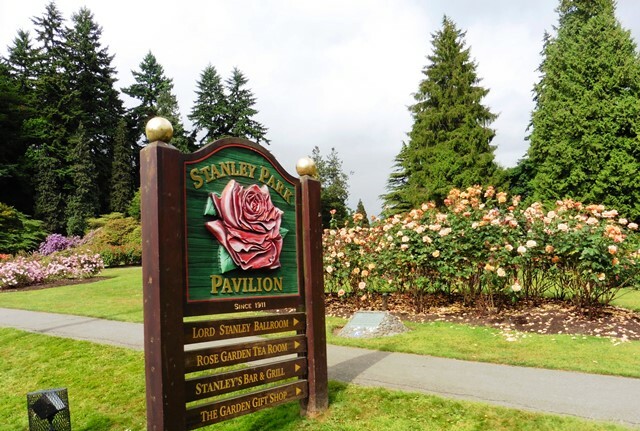 Surrounded by water on almost all sides, Stanley Park is a 1000 acre delight. There’s a 9km Sea Wall path which attracts joggers, cyclists and walkers as well as many trails through the ancient rainforest. 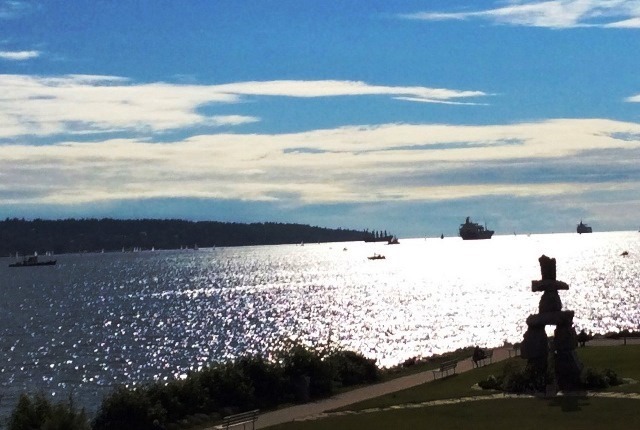 A group of enormous Totem Poles proclaim the city’s First Nation heritage and at nearby Hallelujah Point, the Nine O’Clock Gun has boomed out every evening since 1894. 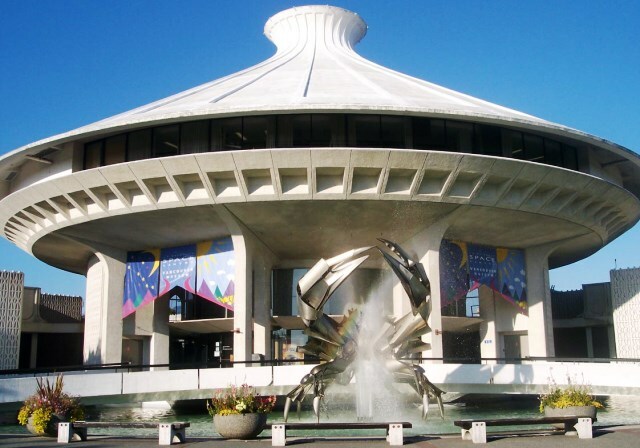 The most popular family attraction is the Vancouver Marine Science Centre, with over 70,000 sea creatures from the Amazon to the Arctic, including beluga whales, dolphins, sea otters, turtles, sealions and crocodiles. There are stupendous views from Prospect Point and beaches all round. Ever seen a steam clock? No. neither had I until I came to Vancouver. Well, in Gas Town, you can see one. It looks Victorian but was actually put up in the 1970s. Every hour it tootles out the Westminster chimes and sends up jets of steam. Gas Town was the site of the original industrial development in the 1800s; timber and the ease of access to the waterways of Canada ensured its success. There are plenty of older buildings which contrast to the glassy skyscrapers, some great bars and cool restaurants plus lots of independent shops to browse around. Fancy a huge plate of burritos and banana bread for breakfast? Or maybe a smoothie made from freshly-cropped microgreens? 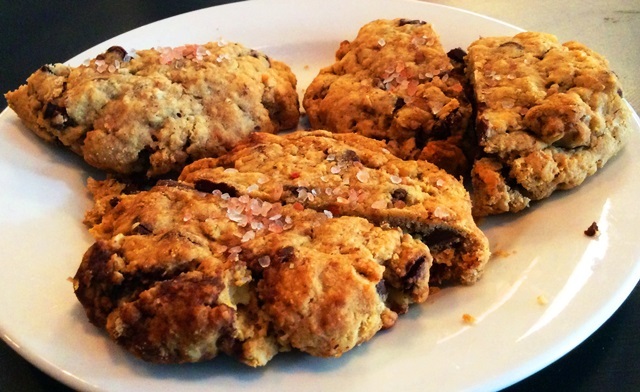 The best chocolate chip cookies in Canada (allegedly!)? Vancouver is a city that loves its food. I don’t mean likes its food, I mean LOVES its food. 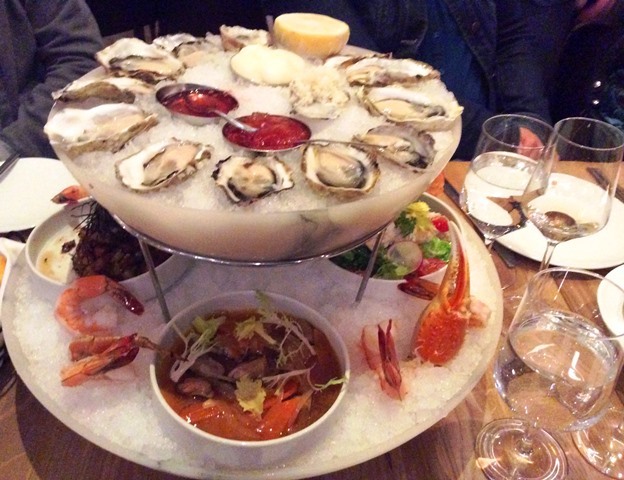 From exquisite Chinese dim sum via fresh local seafood, Italian pizzas to hearty steaks, food is the tasty key to Vancouver living. I can highly recommend taking a food tour with Jenn from Tours by Locals. 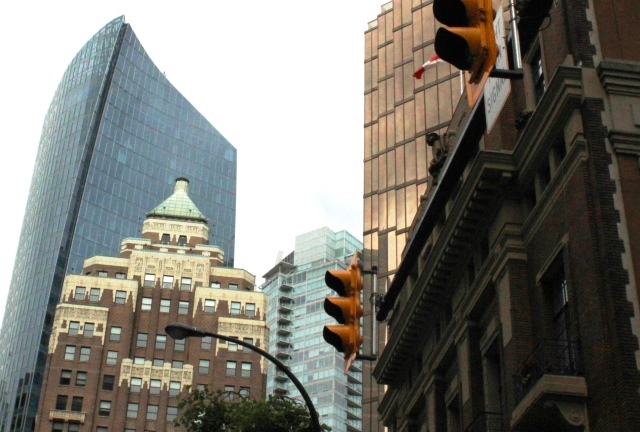 She took us on a two-hour romp from breakfast to lunch across downtown Vancouver. We filled up on a huge selection of Mexican-inspired dishes served by delightfully camp Patrice at the wonderfully OTT diner Elbow Room Cafe. This was followed by a tasting of organic fruit and vegetable juices at achingly cool Krokodile Pear. Most bizarre yet compellingly modern was the scifi looking Urban Cultivator where rows of fridges produce ‘microgreens’ which are made into a huge variety of smoothies including Garden of Eden and Morning Sun. We ended up in at the Musette Cycle Caffe which serves excellent light lunches and snacks, including these scrumptious chocolate chip cookies. Well, maybe not yours but there are plenty of cycle hire shops around the city and it’s very easy to get about. 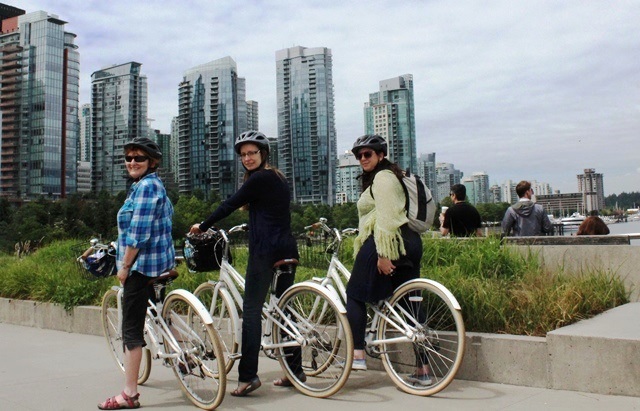 If you have a guide book and a map, just take off and peddle, secure in the knowledge that is probably the most bike-friendly city in Canada. There are many bike lanes and everyone seems generally courteous. 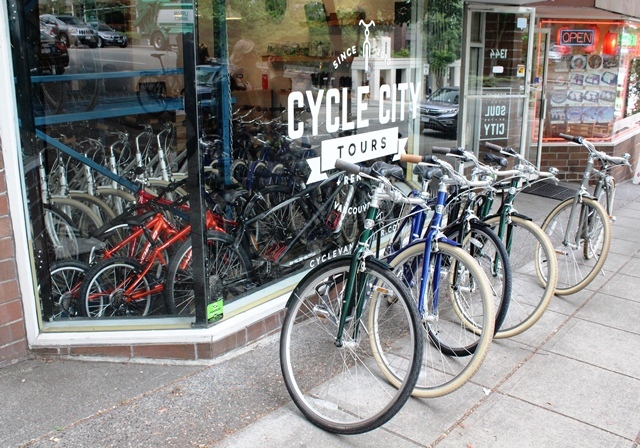 I went on a Cycle City Tours bike ride with fellow travel blogger Lucy Dodsworth (read her account of Vancouver food and art here) and Sarah Sheehan from Destination BC. Our guide, co-owner Josh took us on a fascinating journey past the verdant Law Courts, Marine Building, via Canada Place and along the Waterfront. We stopped off a various places to admire the intriguing public art and take in the ever-changing harbour landscape. We passed the enormous Totems in Stanley Park and Josh showed us the Stanley Great Blue Heronry next to the tennis courts. Cycling beside English Beach we saw many people sunbathing and a few swimming and paddling. You can choose more strenuous routes or a gentle ride enjoying the ever-changing scenery. 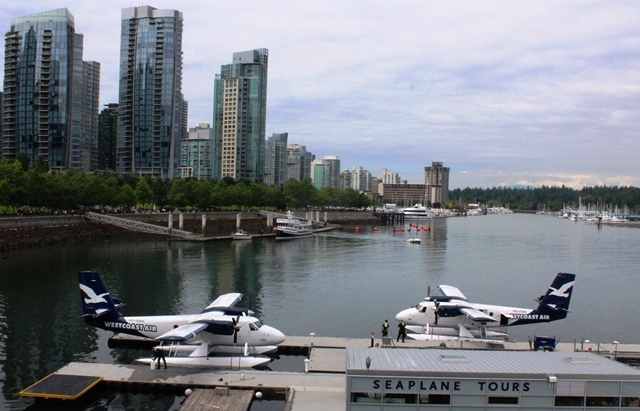 Seaplanes, or floatplanes, take commuters, business people and sightseers up, up and away at regular intervals. You can book a short flight by plane or helicopter above the bay or go much further. (I fulfilled a lifelong ambition when I took a return flight in a seaplane from Campbell River to Knight Inlet in the Great Bear Rainforest; stunning scenery en route and great fun taking off and landing on water.) If you’d rather keep your feet on the ground then you can get an overview, not just of Vancouver, but the whole country with a virtual aerial tour from coast to coast with FlyOver Canada. 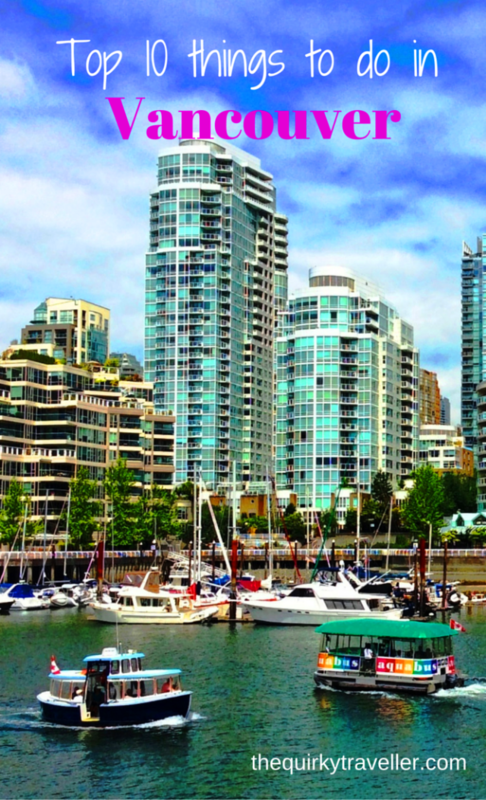 Vancouver Harbour is one of the loveliest in the world and the best way to see it is from the water. It’s a working waterway but has plenty of pleasurable ways to view it. I got the colourful little Aqua Bus over to Granville Island. Even on this very brief trip I saw a huge number of craft from speed boats departing to find somewhere to waterski, bigger ferries heading off around the coast, smaller ferries carrying passengers around False Creek, tour boats full of tourists hoping to see whales, yachts setting sail in the brisk breeze and plucky kayaks weaving in and out of all this traffic. 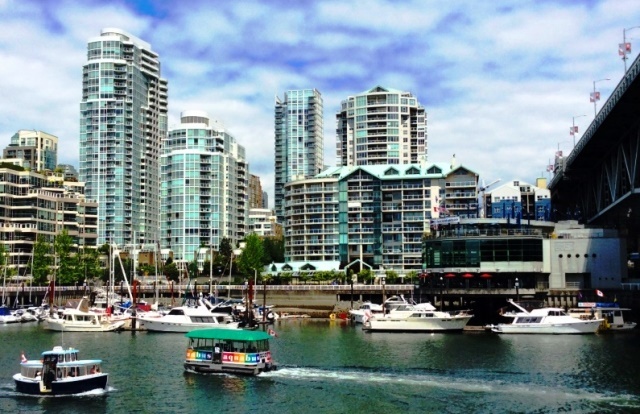 The biggest attraction is being able to see Vancouver’s impressive architecture from the water; gazing up at those fabulous sky-scrapers is a truly awe-inspiring experience. 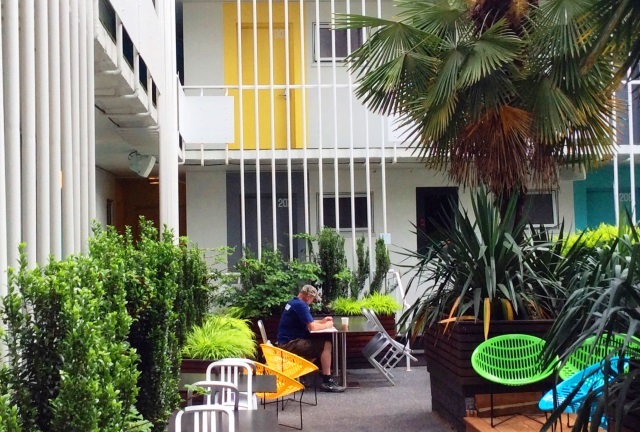 Join Kathryn Burrington to see even more of Vancouver. There’s a museum to suit every interest and all ages in Vancouver, from the world-renowned Museum of Anthropology, with its enormous collection of aboriginal artefacts housed within a sensational building, via the Police Museum, Koerner Ceramics, Bill Reid Rotunda, Neon Vancouver, Vancouver Art Gallery and Maritime Museum to the quirky Museum of Vancouver, with its iconic metal crab sculpture outside and superb collection tracing the history and culture of this part of British Columbia through thousands of objects and into the future with the HR MacMillan Space Centre next door. After all this sightseeing and culture, it’s good to relax. 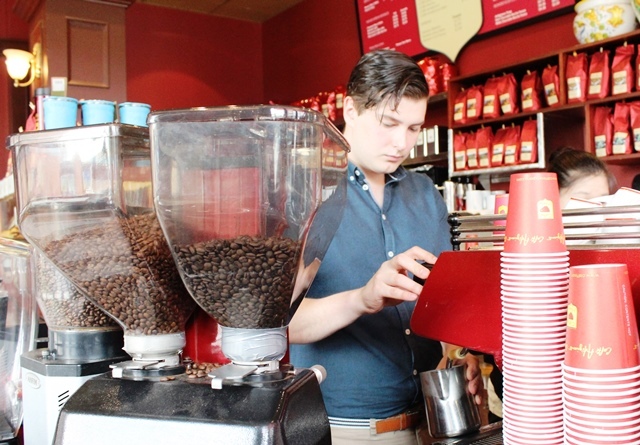 Vancouver loves its coffee and the cafes are more than a ‘culture’; they’re a way of life. This is no 9-5 city; it buzzes all day and night and the cafes are used to meet friends, have business meetings, as informal offices or somewhere to catch up on news. In the uber-cool Caffé Atrigiano, top barrista Josh (yes, popular name) creates a great cup of coffee (top quality fresh Arabica beans) whilst the beautiful people sip and chat. 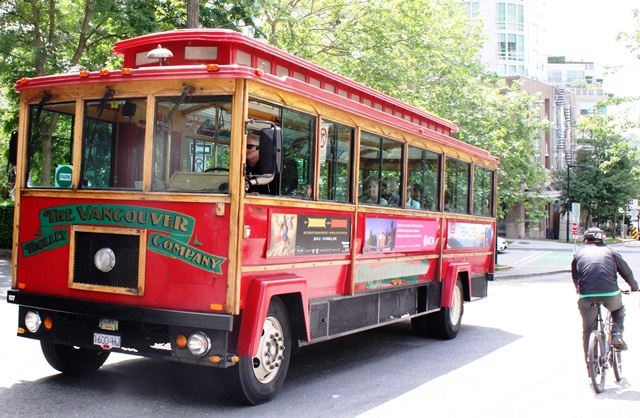 The Vancouver City Passport gives great discounts and free entry to many of the attractions, museums, galleries, eateries and tours mentioned here, as well as dozens of others. The guidebook has some useful info and background details on the experiences. It’s valid for 2 adults, cost $20 (at time of visit) and can save you loads of money and time. 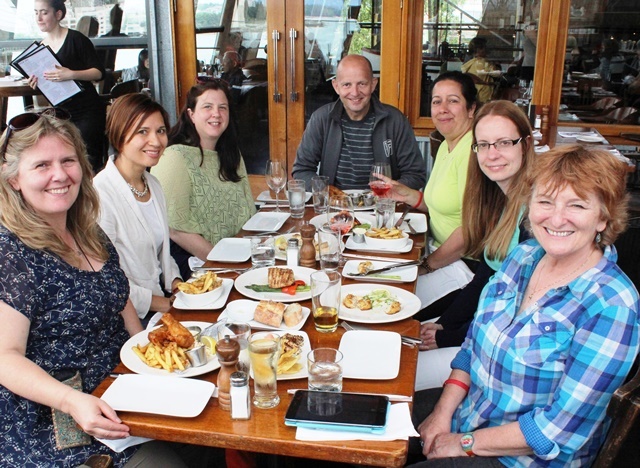 I ended my 24 hours in Vancouver having a superb seafood meal with my fellow travellers at Sandbar Seafood Restaurant on quirky Granville Island. Not only is the food delicous and the staff friendly, the view from False Creek is an ever-changing portrait of this fun, funky, fantastic city which managed to steal my heart in just one day in late spring. 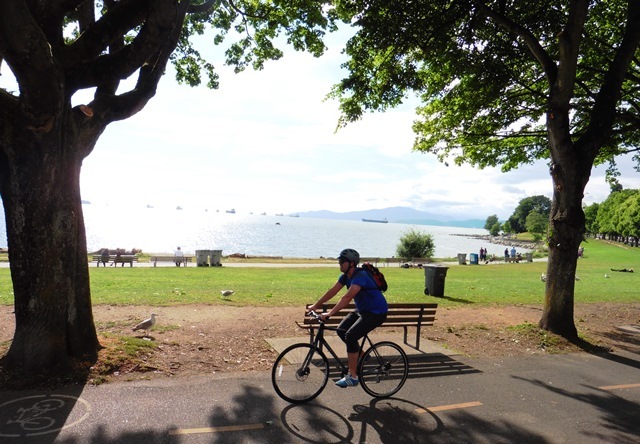 Gary Bembridge shares more top tips for Vancouver here. I was on a Travelator Media trip, staying at the quirkiliciously hip Burrard Hotel in downtown Vancouver as a guest of Destination Canada. 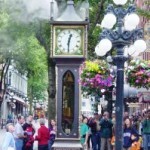 Find out more about awesome British Columbia here. Add this exciting city to your bucket list NOW – you’ll love it. This brings back many happy memories, especially that last meal together in Canada. I wish we could do it all again. Fabulous time with a fabulous group of people. Just wish we had had more time there. Do hope you get to go Carol. It’s a wonderful country; well, the areas I’ve seen certainly are. Really diverse and somehow very wholesome. I so want to see this city. 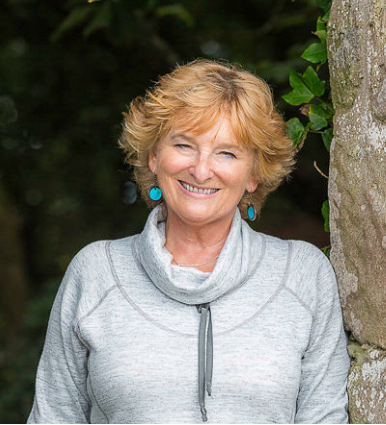 Such a fantastic city – and so diverse an array of things to do out there, wish we had had longer to see some of the museums and sail around the harbour too but the food and art tours were a great introduction and good to save something for next time! Wow, all that delicious food – hope you managed to work it off on your cycle ride!